There's a free or paid version. See the one-minute intro here, then register at Five to Nine now, or get the app for Android or Apple. This series of quick animated videos introduces the basics of mindfulness. You can get this on Five to Nine too. 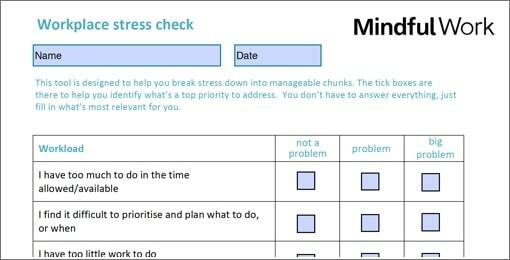 The aim of this tool is to help you break down a general feeling of stress or overload into bite-sized chunks. This can then form a discussion point for occupational health or other interventions. Feel free to make use of the tool and share with colleagues.